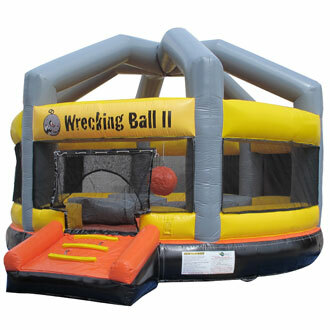 Description: One of the most popular games on the market for all types of events is the Wrecking ball inflatable rental. We are proud to offer this brand new interactive inflatable game rental to all of our customers. This new wrecking ball rental is currently in the process of being approved for use in the state of New Jersey and should be ready for use by early April 2016. The wrecking ball inflatable has four pedestals where four participants stand and try to knock each other out with the foam ball. This game includes safety head gear for the participants. Add the wrecking ball rental to your next event to keep you guest entertained, have peace of mind knowing it has been NJ inspected and approved like all of our inflatable rentals. Our wrecking ball inflatable rental requires a 30ft long x 30ft wide space to be setup. We have a free delivery are within 20 miles of our location for your wrecking ball rental.